Different doors are suitable for different people. Most people will need to consider the practicality of using the doors, as well as how their choice of patio door will affect the value of your home. At Bifold Doors UK, we are experts in the door industry and also work with windows, orangeries and roof lanterns within our sister companies, therefore, we know what is important to consider when choosing your doors. Patio doors are an important choice for a number of reasons. First of all, your choice of patio doors will need to be secure and will need to work well with the style of your property. How often are you using the doors? Are your patio doors your first point of exit, do you have a front door and a back door that you can use to take the wear and tear off your patio doors? Do you have a large family with children that would enjoy going in and out the house or pets that may want to roam freely in the garden? Do you have a patio area that you’d like to make use of? How much space do you have available around the doors? Does your garden get heavily affected by the wind i.e. would your doors always be slamming shut? Do you live in a house, bungalow or flat? Are you installing the doors at ground floor level? 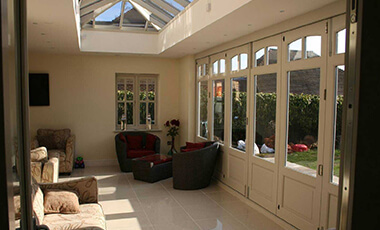 The most advantageous point about bi-fold doors is the fact that they are incredibly space saving. In fact, they save over 70% of the space of the area around the door opening. In addition, they offer an extremely aesthetic appearance. Although they are made up of more panels than your typical sliding door or French door, this does not mean that they have a less elegant appearance. After all, you can prioritise having more glass panels to let maximum amount of natural light into the home. The main difference between sliding doors and bi-folding doors is the fact that sliding doors offer a simpler configuration in that they simply slide together rather than fold together in a complex (yet functional pattern). Sliding doors are ideal for those looking for a similar look to bi-fold doors, offering the same space-saving advantages, yet looking for a cheaper option of patio door. French doors offer a truly classic and grand look. Many people favour French doors for their luxury appeal, although may not be as practical for those wanting to leave their doors open for extended periods of time, in the summer, for example, unless you had enough space to secure them open. In addition, French doors take up much more room that sliding or bi-folding doors. Here at Bifold Doors UK, we have a range of hardwood patio doors available to our customers. Whether you favour the classic look of the French door, the modern look of the sliding door or the functionality of bi-fold doors, you’ll find what you’re looking for in our high-quality range of patio doors. How much do patio doors cost?